alaTest har samlet og analyseret 1031 anmeldelser fra magasiner og hjemmesider. Anmeldere kan virkelig godt lide størrelsen. Også skærmen imponerer, men mange er mindre positive med hensyn til pålideligheden. 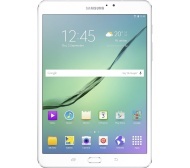 The Samsung Galaxy Tab S2 8.0 is so small and light, you'll forget it's in your bag -- or hands. The Samsung Galaxy Tab S2 has bright and vividly colorful screen. Its rail-thin design is comfortable and ultracompact. It comes with 32GB of storage, a microSD card expansion slot and fingerprint scanner. Battery life is long. Unlike previous models, there's no IR blaster. One of the thinnest and lightest tablets also has one of the most vibrant screens. The Samsung Galaxy Tab S2 9.7 has bright and vividly colorful screen. Its rail-thin design is comfortable and ultracompact. It comes with 32GB of storage, a microSD card expansion slot and fingerprint scanner. Battery life is long. Unlike previous models, there's no IR blaster. In smaller hands, it's not as easy to use as the 8-inch model. The large, sharp screen of the 9.7-inch Samsung Galaxy Tab S2 is great for watching media and playing games at home or on the road. Gorgeous AMOLED display; Strong performance; Svelte design ; Short battery life; Blurry front camera ; The 8-inch Tab S2 impresses with its very slim design, gorgeous display and powerful performance, but its battery life is short. Short battery life; Blurry front camera ; The 8-inch Tab S2 impresses with its very slim design, gorgeous display and powerful performance, but its battery life is short. The 8-inch Tab S2 impresses with its very slim design, gorgeous display and powerful performance, but its battery life is short. The Samsung Galaxy Tab S2 represents an upgrade in size and name only. It has a thinner and lighter profile than its predecessor, with a new 4:3 aspect ratio, but the specs bump is small and battery life is short.